I know it might be hard to tell but can any one tell me what this might be please? There are about 20 shooting up under a tree at work. Is there a stem of any sort on it Sgt. Colon? There is and they are getting bigger. I'll get another photo of them later today. They had all gone by the time I got around to getting another photo, so they must have been edible. 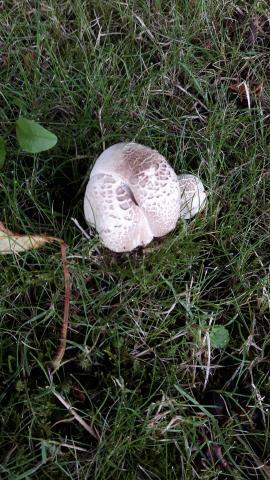 some folk recon shroom toxicity isn't defensive as it is often the diners species that matters rather than what usually eats them . flies and slugs etc have eaten shrooms a lot longer than humans but it is humans who die from em etc . there are a few that nothing critter shaped seems to eat but are ok for people.